Condition is Pre-owned. The Alli is a fashionable, fully-enclosed professional shoe featuring a Black and Silver Rose leather on our mild rocker outsole. Hand sewn, leather lining, superior arch support, and plenty of room in the toe box. For sale: Alegria size 41 (US size 9.5-10) Black, Never Worn Asking $30 Shipped with USPS Priority Mail. EU 38 (US 7.5). Neoprene front upper. 1.5” heel. ALEGRIA "VIC-283" SLIP-ON BLACK COMFORT SANDALS SIZE 41 U.S. 10.5-11 WOW! They are gently used and in very nice condition. They are a BLACK with and irradescent pattern. These are leather upper & lining, balance man made. These are a very nice pair of Algeriablack floral shoes comfort women’s size 39. These show a little wear (see pictures). Alegria By PG Lite Black Leather Loafer Shoe. Great for casual comfort or duty wear. Ladies size 5 or EU 36. Alegria Verona Yeehaw. Size EU39 US 9. Black Leather Comfortable Sandals. Embossed leather. 61794SH23&. Type - Comfort, Emma, EMM-548. Style - Emma. Material - Leather Upper, Leather Lining, Balance Man Made. Color - Black with Bronze Floral Design. Breathable Leather Footbed. Embossed leather with intricate floral pattern. Alegria Holly Spiffy black comfort slip on clogs US Size 7-7.5 EUR 37, almost new worn once! Alegria PG Lite ALG-404 Giraffe Comfort Slip On Leather Clogs Sandles Womens Euro 40/10. Normal wear and tear Shipped with USPS Priority Mail. Only worn one time. I need a 38 in this style. They are great comfortable shoes. Work or play. From smoke free home No returns Only PayPal accepted. Will ship via USPS within 3 business days upon receipt of payment. 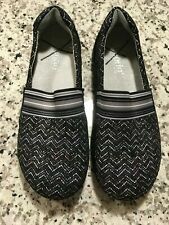 ALEGRIA "KEL-431" BLACK SLIP-ON COMFORT SHOES WOMEN'S SIZE 36 U.S. 6 - 6.5. Condition is Pre-owned. Shoes are jn good preowned condition. Please refer to the pictures as they are part of the description. Shipped with USPS Priority Mail. Thanks for looking. Superb pre-owned condition. Signs of light normal wear. Enlarge photos for details regarding condition and appearance. This item was cleaned with a professional cleaning agent to endure best quality. Bottoms of the shoes are dirty and have wear. Insoles of the shoes are in good condition and have very light wear. Outsides of the shoes are in good condition and have very light wear. Length: 10".